Before we get into the exciting world of state law and HAUP's shirking of fiduciary responsibility let me tell you what I see in the stock. I think most likely it's very cheap but I have no numbers to back that up. HAUP makes many different electronic products to do with digital video and TV. They have products to stream live TV to your electronic devices. They have cables and boxes to send video back and forth between TV and a computer. They have products to record, crop, and create videos. They have DVR type products. They have TV tuners. They are all over Amazon. When they last filed a 10k almost five years ago they were spending $3M annually on R&D. This is a real company with real revenue and real potential. Let's start with a chart. My favorite! See below for all time, 10 year, and 5 year. The company de-listed from the SEC in Mar 2014 and haven't communicated since. The stock sits at $0.05. This is what I would call "left for dead". What value destruction. You can see the stock price drop in 2013 as revenue fell. In early 2014 NASDAQ delisted the company then five months later HAUP gave up and de-registered from the SEC. From a chart point of view what I see is a stock at an all time low. 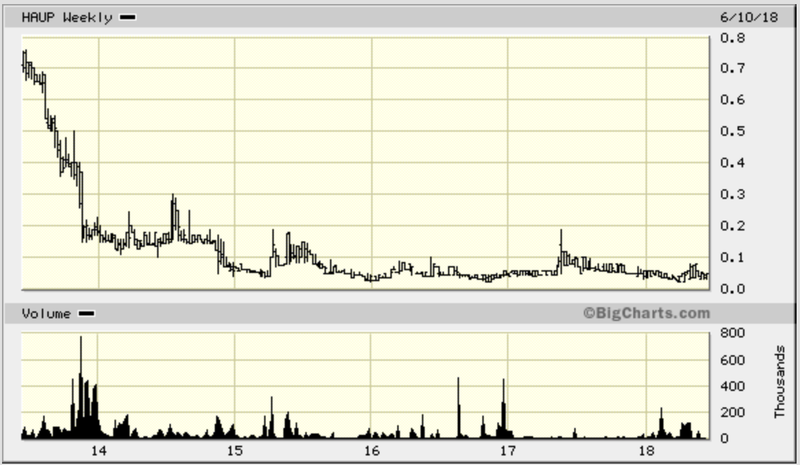 It has been building a base for the past 4 years and sits at support. This would be a buy. Let's talk value at the point when they stopped communication. Revenue was $34M and dropping but only a few years prior it was $100M. The company was losing money with negative book value, mostly due to $12.5M in accrued expenses. The company is in a good field and they are developing new products to prepare for the future. I'd put company value at $20M at least = $1.83 per share. Maybe you could say a fair value would be the $1.00 - $1.50 range of 2012. Since de-registering they have not communicated but are alive so somehow they found a way around the debt. The stock price sits at $0.05 which would be a $0.55M market cap if the share count hasn't changed. They redid their website sometime between Jan 29 and Feb 24 of 2018. The old site looked fine and the new one looks great. It's a modern showcase of all their products and looks impressive. Definitely looks better than a half million dollar company to me. The most interesting thing is HAUP filed a press release in Apr 2018 for the first time in years. Of course they left out the stock ticker but they announced what they must feel is an exciting new product, Cordcutter TV. In Jan 2018 Pixelworks announced their chip will be inside of HAUP's new Cordcutter TV. I don't know. I think $0.05 is cheap but we have no idea the share structure or debt. How much dilution has come? This is where the gamble comes in and you have to think about upside vs downside. I think upside is huge with a potential share value of $2 or more. Not long before going dark the stock was at $1. Downside is 5 cents. The catalyst would be a company sale or communication. Many companies come back from the dark and I hope HAUP will follow suit. All it would take is a posting of some good numbers and the stock will move big time. HEMA did it as did MRCR, EKCS, CNGA, and so many others. I'm not holding my breath. The reason HAUP thinks it's OK to stop communicating is the horrid SEC rule 12g that allows companies to de-register from the SEC if they have fewer than 300 of shareholders "of record". Once a company de-registers they are no longer required by the SEC to file reports in the public domain and that is exactly what HAUP has done. For more information on this criminal SEC rule I encourage you to read my blog post here. The approximate number of holders of record of the Common Stock as of November 7, 1995 was 77. The Company believes there are in excess of 750 beneficial holders of the Common Stock. So HAUP is required by state law to give me financial statements and hold an annual meeting. They are doing neither. Below is my communication with their CFO. He is hiding behind the SEC fair disclosure rule while ignoring fiduciary duty and state law. Could you please send me the latest annual financials. A report would be great but if only the financials are available I'll take that. SEC rules allow companies that have under 300 shareholders to go dark. Once the SEC allows a company to go dark the company is no longer obligated to file public reports. 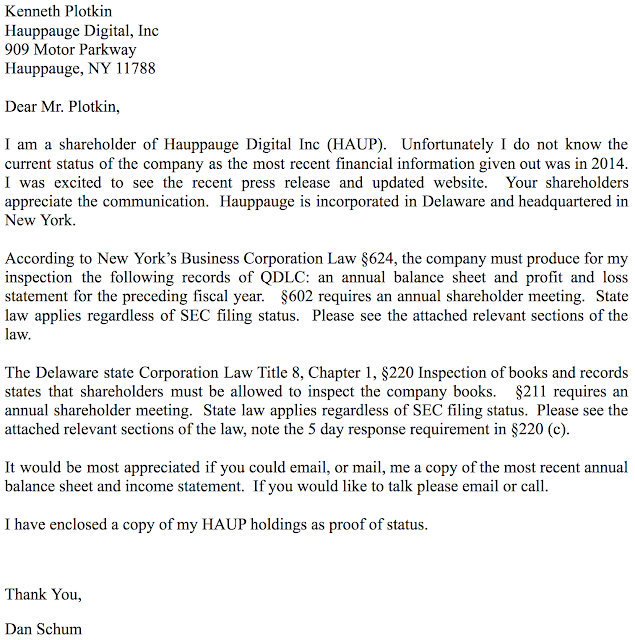 Since Hauppauge Digital Inc. has under 300 shareholders, on July 28, 2014 the SEC accepted our application to go dark. In accordance with this rule, we have not filed any financials since the quarter ended March 31, 2014. HAUP is incorporated in Delaware. The Delaware state Corporation Law Title 8, Chapter 1, § 220 Inspection of books and records states that shareholders must be allowed to inspect the company books. This applies regardless of SEC status. State law also requires annual meetings. HAUP is headquartered in New York. New York state Business Corporation Law §624 Books and records similarly states shareholders must be allowed to inspect the books. It also states the company must provide shareholders with annual financial statements including the income statement and balance sheet. State law also requires annual meetings. Please send me the annual financial statements for the most recent fiscal year. We have been advised by our attorneys that we would be in violation of SEC fair disclosure regulations if we issue non public financial information to one shareholder. Our outside counsel advised us that during this dark period we cannot issue financial information to only one shareholder. You are misinterpreting SEC guidelines and breaking the law. I have quoted you the state laws. You are able to look them up yourself and you, as the CFO, have a responsibility to do so. You are hiding information from an owner of the company. I don't know how anyone can come to an interpretation that this is the right thing to do. When and where is the next annual meeting? State law also requires annual shareholder meetings. So Jerry refused to send me the financials that state law dictates he must share. I followed up with a paper letter requesting the financials along with copies of the law and proof of my share ownership. I mailed one letter to the CFO Jerry Tucciarone and one to the CEO Kenneth Plotkin. That was a couple weeks ago and so far I have no response. I sent a followup email to Jerry yesterday but I'm not expecting much. At the bottom of this post is my letter and the state laws I sent them. I filed a complaint with the Delaware attorney general, explaining HAUP is breaking the law. I filed a complaint with the SEC, informing them their rule is being misinterpreted and used as an excuse to break state law. I don't expect a response but a man can dream, right? The funniest part of Jerry's responses is his title on the website, "investor relations." Why would they bother having anyone in investor relations if they won't tell investors anything? Let me tell you the story of a company. They sold shares to the public when money was needed then pushed the stock into the ground when they no longer cared. This company's directors have a fiduciary duty to act in a manner that will benefit their shareholders. This company's officers have a duty to abide by the laws that govern them. This company has a moral obligation to do right by their fellow man. Trust was placed in this company and trust has been broken. HAUP was founded by two couples: Kenneth R. Aupperle, wife Laura Aupperle, Kenneth Plotkin, and wife Dorothy Plotkin. In 1995 the company decided they needed help from the public to fund operations. They could not do it on their own. They asked for money from you and I in exchange for company ownership. HAUP sold 1,333,333 units to the public at $3.15 per unit. Each unit consisted of one share of $.01 par value common stock and one Class A redeemable stockpurchase warrant. Money from the IPO was used to pay off debt and fund operations. Jerry Tucciarone was CFO. Company operations were run in a building owned by the founders, with rent paid by the company of course. The company's very first proxy, in 1996, shows each of the founders with 287k shares = 10.4% of 2,756,183 outstanding common shares. Of course the founders gave themselves stock options and over the years stayed around 10% owners as share count rose up to the latest reported 2014 count of 10.9M. I don't know if the Plotkin's have ever sold shares. Latest count has Kenneth with 911k = 9% and his wife with 550k = 5.5%. Kenneth Aupperle died and his wife Laura sold their shares between 2005 - 2012. I haven't looked at the filings but the chart shows prices from $1 - $7.50 in that timeframe...1900% to 14900% above the current stock price. 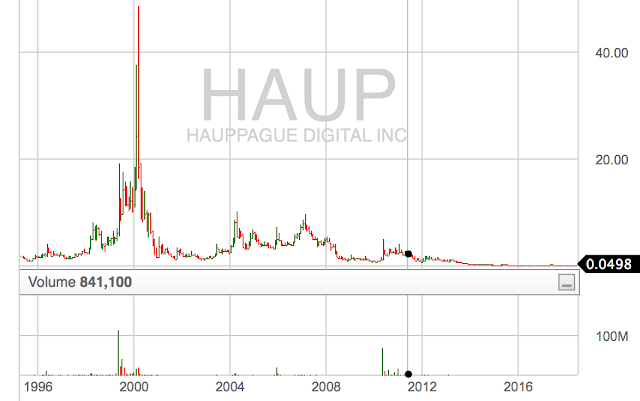 The stock price was $0.27 when HAUP delisted in July 2014. It now sits at $0.05, down 81%. What have the founders received over the years? Salary, stock options, rent payments from the company. And what has the public received? Dilution gives the public 25% of the stock they once owned. 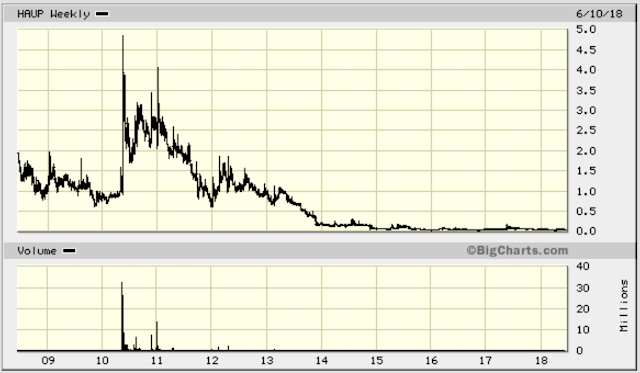 The stock sits 98% below it's IPO price. HAUP delisted and ran into the corner to hide. They know they have more than 300 beneficial shareholders. 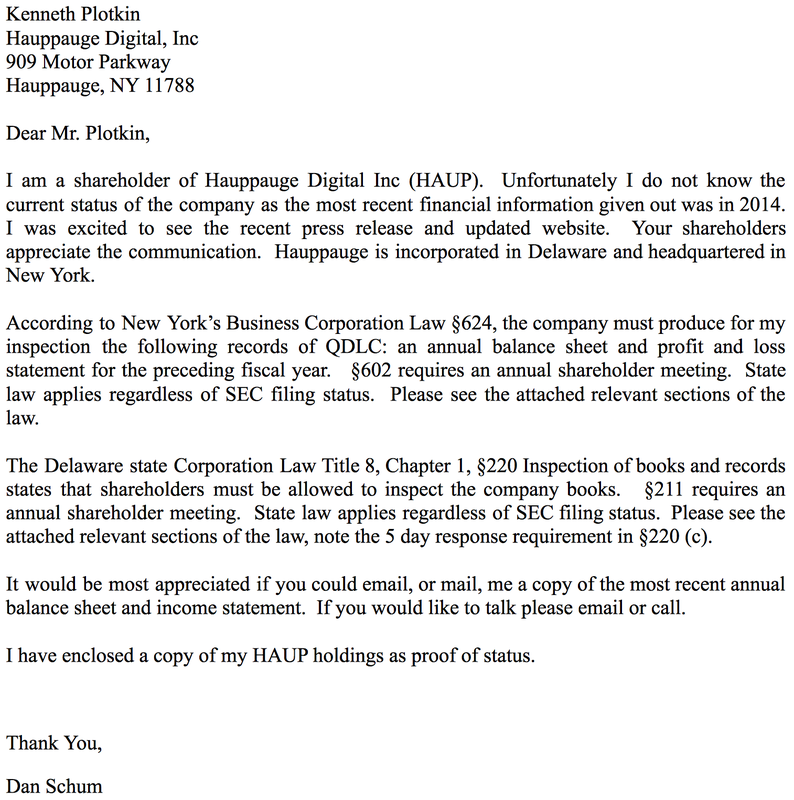 HAUP doesn't even think enough of its shareholders to tell them what's going on. This company that asked for money now could care less. I'd like to know how HAUP's board of directors think they are fulfilling their fiduciary duty as the stock price sits at nothing and they hide information from their own shareholders. It wouldn't take much for HAUP to make it better. I imagine they de-registered to save money. They must still keep books so all they have to do is publish the information. They could post reports on their own website like DEWY and HEMA. They could send out only an annual like SIMA, COMX, or ADDC. They could forgo the audit to save money and only send out reports on request like MRCR and EKCS have done. IOMT hasn't been audited for years and only posts an annual to their own website. It is so easy to make this right. Do the right thing, HAUP. Show us what's behind the curtain. 624 - Books and records; right of inspection, prima facie evidence. § 624. Books and records; right of inspection, prima facie evidence. written form within a reasonable time. requirements of a writing under paragraph (b) of section 609 (Proxies). obtain information about beneficial owners not in its possession. procuring any such record of shareholders for any such purpose. order should not be granted permitting such inspection by the applicant. relief as to the court may seem just and proper. and profit and loss statement. 602 - Meetings of shareholders. § 602. Meetings of shareholders. so fixed, at the office of the corporation in this state. respond thereto prior to such meeting. Ken Plotkin has cooked the books and used the company as an ATM for multi years. If he cared about his stock the company wouldnt trade at .03. He DOES NOT want this in the light ever again. 1) Your returns have trumped mine by a large margin so obviously I have no place in saying this but surely buying HAUP is speculation and not (Value) investing. If you do not have financial information how the heck can you value the business and buy stock like you are? 2) I actually agree with Jerry here, disclosing not public information to you and no one else doesn't seem fair. What you should have done is requested on behalf of all shareholders that info goes on the website. I get that they are violating state laws but this I never knew that state laws could contradict SEC laws either. Giving you information advantage is like insider trading in my view, you would have material non public information. Someone higher up needs to look into this legislation and update all this stuff. 3) You wrote "The company's very first proxy, in 1996, shows each of the founders with 287k shares = 10.4% of 2,756,183 outstanding common shares. Of course the founders gave themselves stock options and over the years stayed around 10% owners as share count rose up to the latest reported 2014 count of 10.9M. " How have they stayed at 10% owners if shares outstnading went from 2.7M to 10.9M and it was all via stock option grants? That looks like moving from 10% to 80% share ownership, which would make sense given the crappy governance here. 1. this is very much speculation. this is a gamble. I have others, see my old QDLC posts and VLXC. I suppose it's sort of like value investing but the value is a guess. As far as postin reports to their website I would love that. I don’t know if I discussed that with HAUP but it’s mentioned in this blog post and I regularly encourage dark companies to do that. You didn't approve my comment? Thanks for that article. Factiva has quite a few Hauppauge or Plotkin stuff going back a while so they're active. And they clearly sell products. For instance, some of their amazon listings have hundreds of reviews. If 2% of people leave reviews and the average retail price is $100, 1,000 reviews would apparently indicate a level of sales ($5M) well above the current market cap. Then I jump in! Their products on Amazon have a lot of reviews and not too bad ones either. I have the product. It works as advertised. I bought it because some of the newer Vizio TVs do not come equipped with TV tuners (they're effectively giant computer monitors). You can save hundreds of dollars vs. a comparably Sony if you buy the Vizio without the tuner. See how popular you are with your dark stocks, lol. Dan, there is a simpler path forward here than making complaints to the AG. You need to file a lawsuit in the Delaware Court of Chancery seeking a court order to compel the company to respond to your books and records demand. It will cost at least several thousand in legal fees, but you may be able to recover that. Otherwise interesting scenario and fascinating post! As a former user of Hauppauge products (PVR capture cards) at the beginning of the century I can perfectly understand how the company moves between good and bad times. Occasionally, they'll have a 'hit' product. HAUPPAUGE COMPUTER WORKS, LIMITED (UK): Dissolved on 16 January 2018 ( https://beta.companieshouse.gov.uk/search?q=hauppauge ). 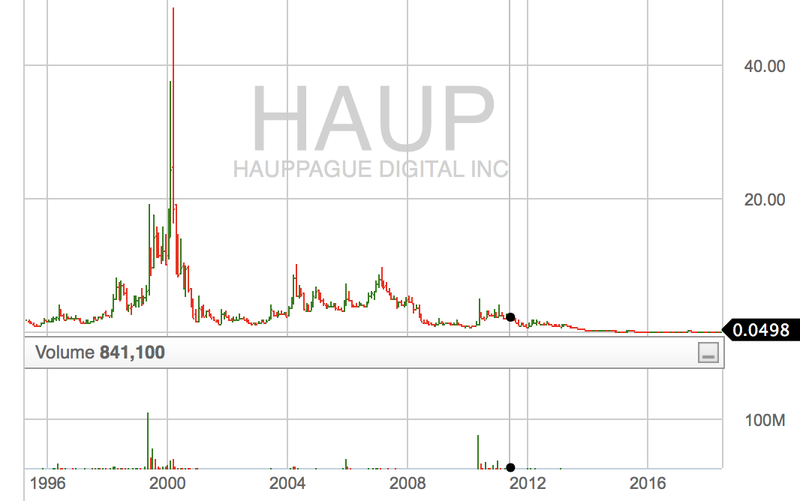 Note that share(s) were held by Hauppauge Digital Europe SARL. This leaves me a bit puzzled on the European holding company, i.e. does it still exist and where is it domiciled. Google further resulted in this? Isn't there any filing of information in the US? #outstanding shares? Company definitely has meat on the bone according to LinkedIn (>70 employees, but no job vacancies). Note the interesting statement of a disgrunted employee on Glassdoor: "The company is dying fast, they have had to dissolve the old Hauppauge to create a new business so they don't have to pay their old debts..I would not recommend this company in the least." I scored me some HAUP after reading your article, and I appreciated the comments for some additional background. I guess it may feel like an echo chamber but it's very helpful, thanks Dan! Dan, keep it coming. Let us know if you hear anything. Thank you for publishing this. I'm curious when I see such activity and am always curious as to what the follow up is. As like you said, it is pretty much set in stone what they need to do for minority shareholders, but when management acts badly, it doesn't seem like there is a lot you can do unless you get attorneys involved. I've heard of some people contacting the AG's office, but that may result in at best, a follow up to the company, to at worst, just ignoring it. Otherwise, I'm not sure what sort of response you would get if you hired an attorney to sent them a letter, or if it went to court, which court it would go to and if there are penalties by statue (or if you would just be granted the right to inspect and potentially get your legal costs reimbursed). Because, if it was a slam dunk sort of thing, I figure there would be a few attorneys out there looking for such opportunities to take such companies to court. How to make Haup worth the 30-40mm it really is worth(or more? Nice writeup. Like your tenacity. Your letter to Plotkin noted symbol QDLC, though suppose you already knew that. How does company justify hiding behind the SEC when HAUP de-registered from the SEC? Absurd. Today I visited the HQ of Hauppauge Digital (HAUP). The CFO refused to give me their financial statements. This is illegal under both NY & DE law. I have filed a complaint with both the NY & DE Secretary of State. That is great! Maybe if people keep putting pressure on them something will happen. Thank you for doing this. As I'm always interested in seeing such stories and their outcomes. In addition, it sounds like you have some support over at CoFB and that someone else may be interested in activism on this company as well. Thanks, Dan. Appreciate the post and the updates in the comments as well. Checked out their website - they sure do sell a lot of products. I went to newegg and even read the reviews on some of their products. General perception seems to be : innovative and useful products, but dated software and poor customer support. If you happen to hear back on any of the financials, please share it here. Thanks! thanks. I saw that. He found some good web info.